Why the 2003 Volkswagen Jetta? What's not to like about 40+ mpg around town and 55+ mpg on the highway? Seriously, any car after this will be a disappointment. And it's not like the engine is a wheezy rattler. The high mileage comes with a very driveable engine -- turbodiesel torque comes on very low and is steady up to redline. 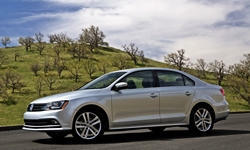 And the TDI offers as much torque as the VR6 engine and less noise at highway speeds than the 2.0 liter engine. More current diesels are quieter. But they also don't get the fuel mileage. I'll take the trade. It's a Volkswagen. This one has been a good example of its type. I've had some odd issues but not as many as some people. VWs seem to trade reliability for durability. They demand their routine maintenance and addressing issues before they become bigger repair bills. These cars are not as tolerant of abuse as, say, a Toyota Corolla or a Ford Focus. And stuff does break -- weird stuff like turn-signal stalks. On the other hand, they seem to wear better. At almost 13 years old, I see only one tiny spot of rust starting to bubble through the hatch. The interior is intact, with no upholstery rips and a headliner still clinging to the roof. The engine is doing fine and I'm still getting 40-55 mpg. I'm not driving the car much anymore, so I plan to keep it for a good long time yet. I imagine people will be looking at this review thinking they might buy a used TDI. I'm fully in favor of that. But I have a few useful thoughts: - This engine needs to run. Short-hop driving will keep the engine from warming up and that will cause premature failures and some expensive repairs and you won't get the mileage everyone loves. - If you can do the maintenance yourself PROPERLY, this car is a heck of a deal. But if you want to cut corners on repairs or have to pay someone to maintain the car, you'll spend more money than expected on the car. - TDI engines commonly go 300,000 miles. However, atthis point this model is 13 years old and it will not escape the issues of a 13-year-old car. You may have to address some body rust, some grounding/corrosion issues, and some cheap parts and maintenance at the hands of a previous owner. Why Not the 2003 Volkswagen Jetta? That the diesel has been so popular and so restricted in quantity that incentives have been rare. This particular Jetta offers less rear seat room than the previous AND following versions. It seems a bit paltry for a car its size.